The Axel Foundation Program is the main program for geometrical measurement. It also comprises the basic package for the entire range of the Axel applications and other software and uses the latest and most innovative in software engineering technology, The Foundation Program is Axel’s main screen a user starts the operation from this initial point the user can access all the feature of the program. The Program has the capability to measure any type of shapes including spheres, cones, cylinders or flat surfaces or a combination of any of them. It can be used in stand – alone applications or in combination with any of the other Axel range of program to provide additional enhanced features and benefits. 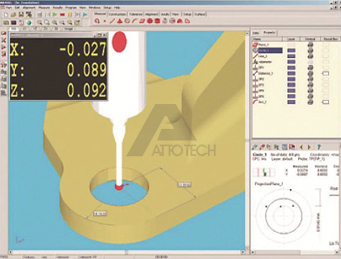 It is particularly adapted for use for manual CMM machines, It also contains manual measurement module with geometrical data processing algorithms. 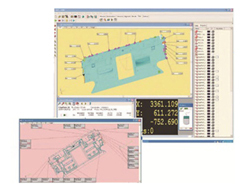 The Visual Programming module provides a quick and convenient way of creating CNC measuring programs visually. 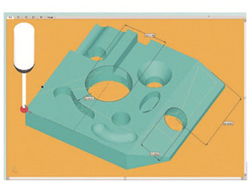 Programs can be created in learn mode, off-line or directly from the CAD drawing. One of the benefits of this Product is that the program can be fully developed and tested for its functionality in a simulation using a “dry run” mode. Programs can be either in full or in parts, With the addition of multiple breakpoint, execution can be started, continued or stopped from any convenient part in the Program. The Surface module superimposes CAD surface features to the standard Foundation program imparting an integrated geometrical and surface measuring environment. It allows the user to measure complex shapes on either manual or CNC Coordinate Measuring Machines. The Program accepts nominal surface models form any CAD programs with minimal effort. A free standing part is aligned by measuring its geometrical or surface features. The program performs a 3D best fit of measured data to CAD surfaces. AXEL provides the most comprehensive range of alignment feature and options that allows the user to deal with the extremely complex and demanding applications. The Axel pipe Wizard is one of the most innovative and modern products form the Axel range. 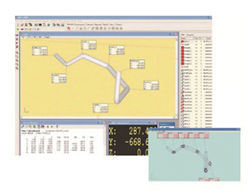 The pipe Wizard can be used to design or create pipes by creating a master template of a particular pipe by the user inputting various points designating the bends. In addition, the user can also inspect pipes against nominal date or templates to ensure conformity. The Axel pipe Wizard will accept nominal data templates in the form of numerical data or CAD models. All results can be presented in both numerical and graphical formats. The strength of Axel reporting facility lies in the ability to customize reports to meet the needs of the operator customer or external quality bodies. Inspection notes and other comments may be attached to the report. 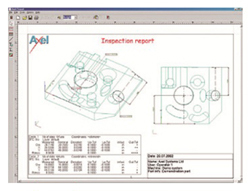 Reporting templates are an integral part of the Axel programs. Various other features and benefits of the Axel Report include the followings.